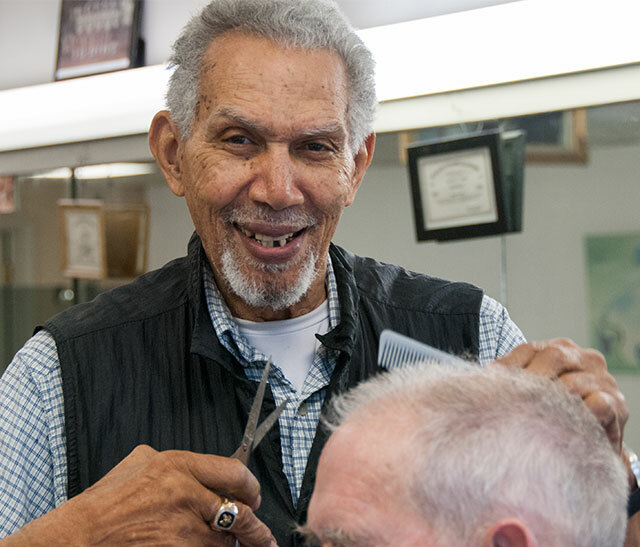 Ken Norton spent Thursday at Raeford’s Barber Shop on South Main Street doing just what he has for nearly seven decades in Davidson – cutting hair. But this day was different, though there wasn’t much fanfare to note it: It was Norton’s last day on the job. Norton retired once before, in 1993, when he closed his own barber shop on North Main Street. That first retirement didn’t work out, and in recent years he has continued barbering two days a week, “just helping out” at Raeford’s. What will he do next? Well, on the first day of his second retirement, he plans to mow the lawn, he said Thursday. And on Monday, he’s planning to volunteer at the Lions Club Regional golf tournament at Northstone Country Club, as he has for many years. “I might be one of the oldest members serving,” he said. I do ceramics and stained glass. And, I’m trying to write my memoirs,” Norton said. Norton lives these days in Kannapolis, but he’s a Davidson institution, having worked on Main Street Davidson for probably longer than anyone still alive. Norton grew up at a home on East Sloan Street, now called Lorimer Road, across from the present-day Swimming Hole community pool. At that time it was the Thompson farm, and he recalls plowing, planting produce, and picking cotton there from about age 7 or 8. “It varied from year to year,” he recalled in a December interview with DavidsonNews.net. He learned to cut hair at the Charlotte Barber School at age 14, taking a course that he said cost $250. Later, he began working at Hood Norton’s barber shop, Hood’s, on North Main Street, perfecting the art of “Nortonizing,” what his customers – from townies to Davidson College students – affectionately call his brand of very short hair cut. He eventually took over the barber shop, and Hood’s became Norton’s. A plaque on North Main Street marks the former location. In 1950, he married his wife, Betty, and they had two children, named after themselves, Kenneth and Betty. At one time, they lived in a house he built on Mock Circle. Besides barbering, his other activities over the years have included serving for decades as a Boy Scout leader (his son Ken II was an Eagle Scout) and volunteering at his church, Sandy Ridge AME Zion Church. He said last December he wanted to keep working “until the Lord sets him down.” Thankfully, that hasn’t happened, and he says we’re sure to see him around town. Feb. 23, 2014, DavidsonNews.net, “Christmas memories with Ken Norton.